CHELMSFORD, Mass. 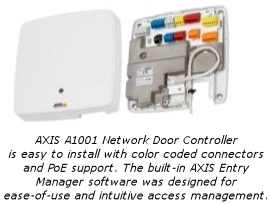 – September 24, 2013 – Axis Communications, the market leader in network video surveillance, today announces it has entered the physical access control market with the introduction of the company’s first network door controller: the open, IP-based AXIS A1001 Network Door Controller. AXIS A1001 will make its debut at Chicago’s ASIS International event in Axis’ booth #1034 from Sept. 24-26. See integrator video case study of first AXIS A1001 install at a medical facility in Kansas City. ● AXIS A1001 coupled with the built-in, web-based AXIS Entry Manager software is a ready-made solution for small- to mid-sized installations – such as at offices, industrial buildings and retail stores – with typically 10 doors and basic access control requirements. ● For larger enterprise systems, the open application programming interface (API) of AXIS A1001 enables Axis’ Application Development Partners (ADPs) to design software solutions that meet specific customer requirements such as video integration and advanced access control functionality. Initially, Axis ADP partners Aimetis, Genetec, IMRON, Milestone Systems, Next Level Security Systems and OnSSI are engaged in the development of solutions. ● Open API designed for compliance with ONVIF Profile C, which will enable interoperability between clients and devices of physical access control systems (PACS) and network-based video systems. Throughout 2013, Axis worked closely with four top National Systems Integrator partners in the U.S. – Diebold, Inc., Kratos Defense & Security Solutions, Inc., Stanley Convergent Security Solutions, Inc. and Wachter, Inc. – to beta test the new access control solution. Axis will launch AXIS A1001 first in the U.S., currently slated for Q4 2013, at an MSRP of $599. The global physical access control market is estimated at $3 billion (2012) and will increase to approximately $4.2 billion by 2017, which represents an annual growth of 7 percent, according to market research firm IHS*. The United States was an early adopter of network video technology and is also a significant market for physical access control. “Axis started its innovative quest back in 1984 by developing protocol converters and then continued to printers and storage devices before inventing and launching the first network camera in 1996. Although we now enter the physical access control market, our focus will continue to be on network video products. We expect physical access control sales to represent a small, but important, part of our total business,” said Mauritsson.